It sleeps for 10 seconds and waits for Main Thread to be finished (WaitForSingleObject()). This is the first time I see that IDA Pro 5.0 free correctly recognized the ServiceMain function with its structure! At first the Service Control Handler is registered with help of RegisterServiceCtrlHandlerEx() function. The Service Handler checks for SERVICE_CONTROL_STOP, SERVICE_CONTROL_INTERROGATE or SERVICE_CONTROL_SHUTDOWN control codes and fills the elements of the SERVICE_STATUS structure with the appropriate values to call SetServiceStatus() function afterwards. Then a new Thread (Main Thread) is created and started by calling the CreateThread() function. There follows final calls to the SetServiceStatus() function. Then it checks if the final Payload (.dll) was loaded into the virtual address space of the current process (checks if "fwdReason" = "DLL_PROCESS_ATTACH ") and exits if not. Next it resolves a bunch of API addresses and exits if one function address can't be resolved without doing anything malicious. It then retrieves the module file name (GetModuleFileNameW()) and tests if it is "svchost.exe". If the final Payload wasn't installed as a Service (check Part 2 -> Registry "SharedTaskScheduler" or "Run" startup methods) the module name is either "rundll32.exe" or "Explorer.exe". Dlls which are present in the SharedTaskScheduler registry key are loaded by Explorer.exe at system startup. If the module name isn't svchost.exe, the malware knows that it had to create the Main Thread (CreateThread()), otherwise the Main Thread is created in the ServiceMain routine. The Main Threads starts with the same anti (AV) emulation technqiue as we have seen before by using a set of MMX instructions. 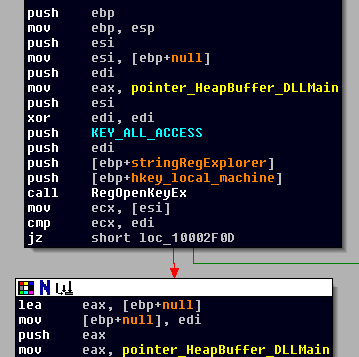 If the instructions aren't emulated the occuring exception is catched and the malware exits. There follows a function which resolves the majority of the Windows API function addresses for later use. 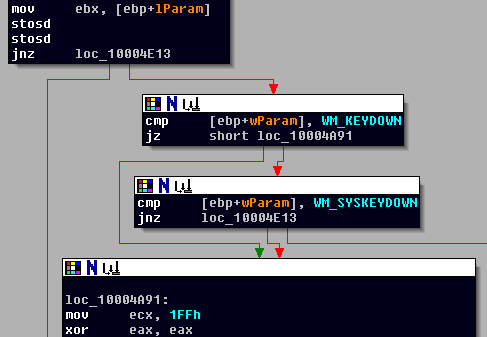 If just one of these functions can't be resolved the malware also exits. Next the module file name is retrieved by calling GetModuleFileName() function and cut to the next directory by using PathRemoveFileSpec() function. This new path ("C:\Windows\System32" or "C:\Documents and Settings\<Username>\Local Settings\Application Data") is set as the current directory with help of SetCurrentDirectory() function. Then the process is set to handle specified types of serious errors, so the system does not display the critical-error-handler message box. This is done to prevent any suspicious error messages done accidently by the malware. In the following function the temporary folder is retrieved to build the strings "C:\Documents and Settings\<Username>\Local Settings\Temp\nvgdata.dat" and "C:\Documents and Settings\<Username>\Local Settings\Temp\nvsdata.dat" (Note: The temporary path can differ, see Part 2). There follows once again the retrival of the "els.dll" file time, or if this fails the system time. Then it opens the "HKEY_LOCAL_MACHINE" registry root key that was created by the 3rd Dropper (see Part 2) to get the encrypted data (RegOpenKeyEx() + RegQueryValueEx()). If that fails it tries to get the encrypted data from the "HKEY_CURRENT_USER" root key that was also created by the 3rd Dropper for that reason. Next, the 9 strings from "IP" entry are decrypted in memory with the same function that was used for strings, functions names and library names at the beginning. Then it checks if the last of the 9 strings is a "1" or "0" (see Part 2). If it is a "1" (as in our case), a new Thread with a Keylogger is created. As a keylogger, the "SetWindowsHookEx" method with type "WH_KEYBOARD_LL" is used (Google: "Keylogger SetWindowsHookEx"). First it checks if a key was pressed (WM_KEYDOWN, WM_SYSKEYDOWN) and then gets the window of the key message by using GetForegroundWindow() function. After the receiving of the pressed key, the function CallNextHookEx() is used to continue. This function is also called if the message hasn't the type "WH_KEYBOARD_LL" to pass the hook information to the next hook procedure, otherwise it would be lost and that would be suspicious. That's all of the code of this final Payload I have analyzed. Below I give you some additional information I stumbled across during analysis, but doesn't had the time to sequence. - Just like the Downloader, it also uses the Common Gateway Interface to transfer encrypted data (the gathered information, ...) to a Server (200.74.244.118), this time with the URL ".../~bing/cgi-bin/..."